If It's Too Loud...: Piroshka - "Everlastingly Yours"
I've always loved a good supergroup. Piroshka might have one of the better pedigrees we've seen in quite a while. It features Miki Berenyi of Lush, KJ "Moose" McKillup of Moose, Mick Conroy of Modern English, and Justin Welch of Elastica. Their single, "Everlastingly Yours," is exactly what you'd want it to be. It has a distinct shoegaze vibe, but in this almost groovy tropicalia kind of way. It's a smooth, chilled out song. It's definitely the sound shoegaze/Brit pop/New Wave bands should be making now, 20-30 years into their careers. 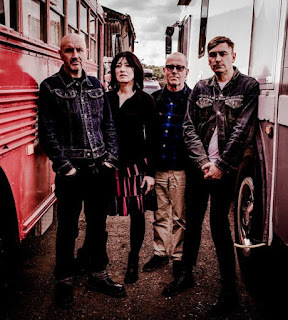 Piroshka are the rare supergroup that have taken all their parts and blended them perfectly together into a more mature and modern sound. You can listen to "Everlastingly Yours" below. Piroshka's debut album, Brickbat, will be out February 15 on Bella Union. The album can be pre-ordered here. For more on Piroshka, check them out on Facebook and Twitter.